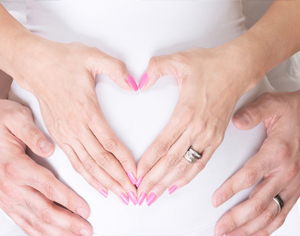 Acupuncture during pregnancy offers a safe and natural approach in helping to alleviate a variety of symptoms. Common conditions seen in clinic include nausea, tiredness, pain, swollen ankles, headaches and digestive problems. At each gestation your health is carefully assessed in order to give you and your developing baby the best treatment. Approaching labour can be an anxious time and so the aim of treatment is to help you feel relaxed and energize the body for the labour ahead. From 37 weeks onwards treatment can commence and continue up until your due date. If you are approaching your expected date of delivery, acupuncture can help ease the transition into labour and depending on your history, acupressure for labour can also be demonstrated. If your baby is breech, moxibustion may help. This involves applying gentle heat with a moxa stick near the edge of both the little toes for 20 minutes a day for 10 days. Your first treatment will be given with your initial consultation, then a further 9 sessions will be carried out by yourself or your partner at home. Even though I got my desired outcome of being pregnant I continued to visit Louise. Treatment provided me with other benefits in addition to my fertility treatment, such as improving my energy levels and general well being, settling nausea and pain relief. Acupuncture helped calm down the severe nausea I was experiencing in early pregnancy and therefore enabled me to start eating and regain my strength. Acupuncture relaxed me when my baby was overdue and within 24 hours of treatment I gave birth to a baby girl. A big thanks to Louise for being part of my birthing journey. Having an acupuncture treatment the day before my medical induction was due really helped me to stay calm and focused. When I found out my baby was breech, I tried moxa treatment which proved to be successful and my baby turned.